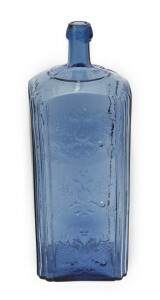 Vodka, derived from the Slavonic word for water, voda, acquired a particular status living up to this root meaning. It has been said that vodka was “the elixir of life, the living water” of the Russian people, becoming both socially and economically vital. The blue glass of the bottle plays on these water references, perhaps intending to speak to the superior purity former serf Pyotr Smirnov sought when he began distilling vodka in 1864. The quality of his product, coupled with his marketing genius and the strategic shaping of his personal image, allowed Smirnoff to become Russia’s most prestigious vodka brand. Today, the brand is equally highly regarded in the United States, providing Americans with an elixir of life of superior quality.